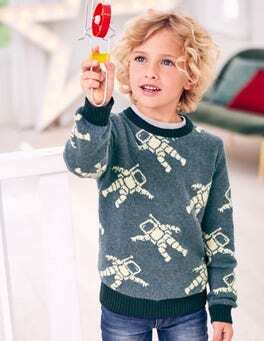 Don't panic, as the teeth are only embroidered on this lightweight raglan jumper. It may look fierce but the touch of cashmere keeps it supersoft. The contrast tipping on the hem and cuffs make it stand out and it's not scared of the washing machine. …our long-sleeve T-shirt are ready to check it out. Made from a patchwork design, they're bound to be the star of the show (or should that be the nativity?). 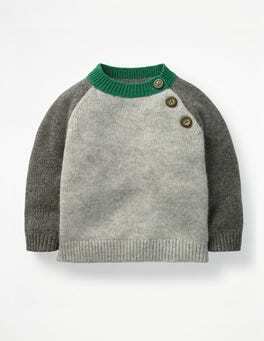 And because the top is pure cotton, it provides a soft layer under snuggly jumpers – so Arctic explorers can stay warm during their adventures. 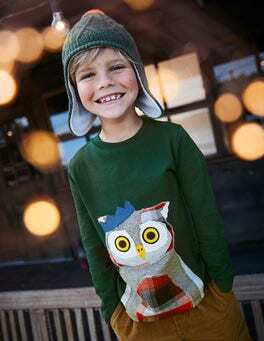 Our recipe for the softest jumper? Mix in a little cashmere with snuggly cotton and top it off with a generous sprinkle of colour on the chest pocket and cuffs. Voila: the perfect knitted layer is ready to brave the chill. There's no doubt about it: chilly afternoons and frosty mornings call for a cosy jumper. 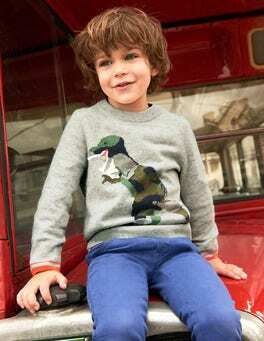 With its fun knitted and embroidered design, this one's bound to raise a cheeky smile. It has buttons on the shoulder to make quick layering as easy as can be. 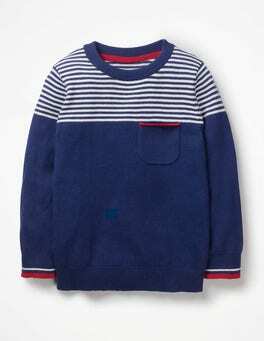 Keep your little one toasty when the temperature drops with this 100% cashmere jumper. The luxurious yarn is not only ideal for warm cuddles, but it's machine washable too. It comes in its own box to make a lovely present – why not complete the set with our matching joggers? What's better than a 100% cashmere jumper? 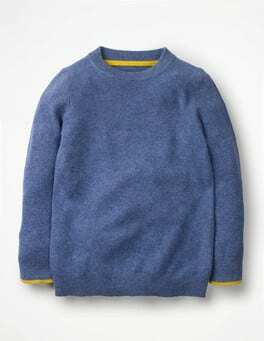 A 100% cashmere jumper that you can pop in the washing machine, of course. This one has a ribbed collar and pop contrast trims on the cuff and inside neck, so it's stylish as well as smart enough for lunch with the grown-ups. What's better than a 100% cashmere jumper? 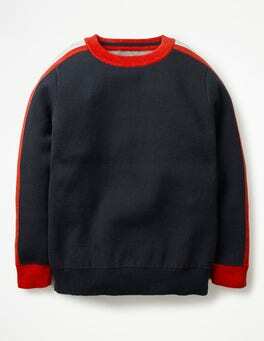 A 100% cashmere jumper that you can pop in the washing machine, of course. This one has a chunky ribbed collar and contrast details on the cuff, so it's stylish as well as smart enough for lunch with the grown-ups. 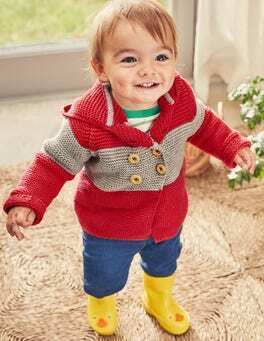 Keep little ones cosy in our cotton-blend hooded jacket. 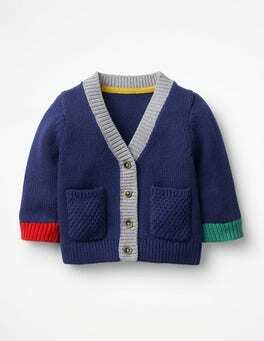 This warm knit features a crochet rainbow which is just the thing to bring a dose of sunshine on chilly days. Large, wood-effect buttons make for easy dressing.